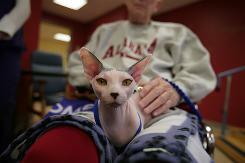 I really wanted to be snarky about this article about sphinx cats being used as therapy cats. After all, it does contain the quote “Terry True says holding Jak is like holding ‘a suede hot-water bottle. '” Which is quite disgusting. But then I read that Jak, the cat in the article, got his start visiting children with leukemia, showing them that hairlessness can still be beautiful. Damn you, sphinx therapy cat! You’re just doing too much good, and I can’t make fun of you. This just in: the first reported case of a feline with swine flu! 1. The cat is 13 years old and from Iowa. Special thanks to the lovely Rachel Shukert, who alerted me of this disturbing trend in flu news. after you massage your cat, let your cat massage you! Last week, we learned how to massage our cats. Now it seems as though our cats were paying attention and have taken things into their own paws. Okay, so this cat is massaging a dog, but humans could be next! Also, they look completely different in the face, but this cat’s body looks so much like my cat Jack’s body that it’s freaking me out. And Jack does occasionally give back massages . . .
Tashi is paralyzed. But since he arrived at Tabby’s Place, an animal sanctuary in New Jersey, in November, he’s been learning how to walk. He has hydrotherapy sessions and does Pilates-like exercises to strengthen his legs and to learn how to walk. He also hangs out with his best friends, two diabetic cats named Albert and Tony. Of course, this is all very expensive. So if you’d like to help pay for Tashi’s Pilates (or his medicine, or Albert and Tony’s medicine), go here. Looks like your average cat, doesn’t she? Maybe you need to see her face. I have to admit that the first time I saw a photo of Chase, I gasped in a mixture of shock/horror/disgust/sadness/etc. Hit by a car when she was just six weeks old, Chase, as you can see, has no nose and is missing quite a bit of face fur. She is not what most people would call cute. But as I read through her website, my feelings started to change. Maybe it’s because I’ve always had a soft spot for fluffy black and white kitties. But seeing her do normal cat things, like playing with her brother, made me realize that she is just as lovable as every other cat in the world, and maybe even more so. And I am so, so impressed with her owners, who have done what many people would never be able to do and opened their hearts to this cat with very special needs. She reminds me and my boyfriend of Juliana Wetmore, the girl born without a face. But at least in Chase’s case, she’ll never really know she’s different, and she’ll never suffer emotionally because of it. Hopefully she’ll have a long and fascinating kitty life.